In the entire history of reality TV smackdowns, it’s likely few have been as decisive as the one administered by Santa Cruz County Sheriff’s deputy Greg Amundson last summer in the middle of the Nevada desert: He shot an opponent in the chest with a Glock 19 handgun. 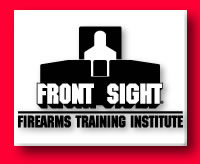 “Challenge” was filmed over the summer at Front Sight Firearms Training Institute’s facility near Las Vegas. While the show began airing on the VERSUS cable network only a few weeks ago, Front Sight instructors have been teaching people to talk, fight, drive and shoot their way out of dangerous situations since 1996, founder and Santa Cruz County resident Ignatius Piazza said. 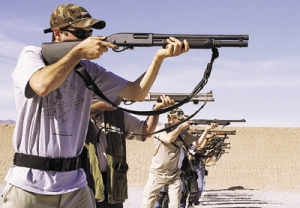 While many of the organization’s trainees are law enforcement personnel or professional soldiers looking for an extra edge, a surprising number are average citizens interested in self-defense and personal enrichment. That statistic was one of the main factors in Piazza’s decision to launch the reality show, he said. Another was what he sees as most people’s misunderstanding of combat shooting. This realization, which Piazza said he came to in the early 1980s, prompted him to meet with every tactical shooter he could find and learn what he could from them. Though he has never served with the military or law enforcement, he maintains that his program is among the most effective in the world and proclaims himself a “Four Weapons Combat Master” —adept at using handguns, rifles, shotguns and submachine guns in high-stress situations. Piazza, now 46, saw “Challenge” as way to test his protégés against more mainstream warriors. Though he is not allowed to reveal the outcome of the contest before the final episode airs, he said he was very pleased with his people’s performance. Part of that interest likely stemmed from publicity — good and bad — already swirling around Front Sight. In early 2001, anti-gun groups were alarmed to learn that Piazza wanted to build a 550-acre “Pebble Beach for gun enthusiasts” near Pahrump, Nev. Initial plans called for 22 shooting ranges, a five-story SWAT rappelling tower and a K-12 school where teachers would go armed, according to the San Francisco Chronicle. Later, the organization also made headlines after 9/11, as counterterrorism techniques were thrust onto the national stage. Piazza made the most of the opportunity, recruiting experts in chemical warfare and close-quarters combat to teach terrorism survival classes for celebrities, CEOs and journalists. He has also offered free firearms training to airline pilots if the government would allow them to carry guns. Still, while Front Sight has not yet reached Pebble Beach status, it is doing very well, Piazza said. The company has opened a new Alaska campus that focuses on hunting and wilderness survival, the Nevada center holds a variety of classes five days a week, just like any college and the company has so far donated $5.13 million to various charities, according to Piazza’s Web site. In spite of controversy, Front Sight’s aim has never wavered, he said. Deputy Amundson, who competed in the handgun division on the show, said the Front Sight students he met were surprisingly good. He said he was impressed when the first contestant to be eliminated was not one of Piazza’s gunslinging hobbyists but a longtime New York police officer. For his victory, Amundson was awarded a gift certificate for Front Sight training and an invitation to return for the rifle competition. Unfortunately, he had a scheduling conflict — his Army National Guard unit was activated. Even so, Amundson said he was looking forward to cashing in his certificate. ’Front Sight Challenge“ airs Friday and Sunday on the VERSUS network. For more information on Front Sight, visit www.frontsight.com.